The Picker palette determines how certain painting/sculpting attributes, such as color, material, depth and orientation, are applied. Normally, the color and material stay the same until you change them in their respective palettes, and the depth and orientation change constantly while painting or sculpting, depending on what information is ‘picked’ from the canvas. 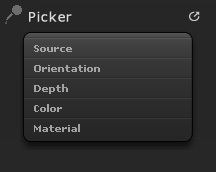 You can choose to ‘pick’ these values from the current (active) layer only, from other layers only, or from all layers. You can also choose to ‘pick’ information once, when the mouse/tablet button is clicked, then hold that information throughout the following brushstroke. Note : should you change options in the Picker palette while sculpting, remember that changes are global and will affect the behaviour of all sculpting brushes.